Ball stud earrings are in this winter and you don’t have to pluck them from your Christmas tree. In Ana Luisa’s unique earrings collection you can now find six new pairs of glossy and feminine solid gold studs that will make your winter a magical one. And because we know you can’t wait to get your pair of ball studs, lets’ see how to style these earrings. 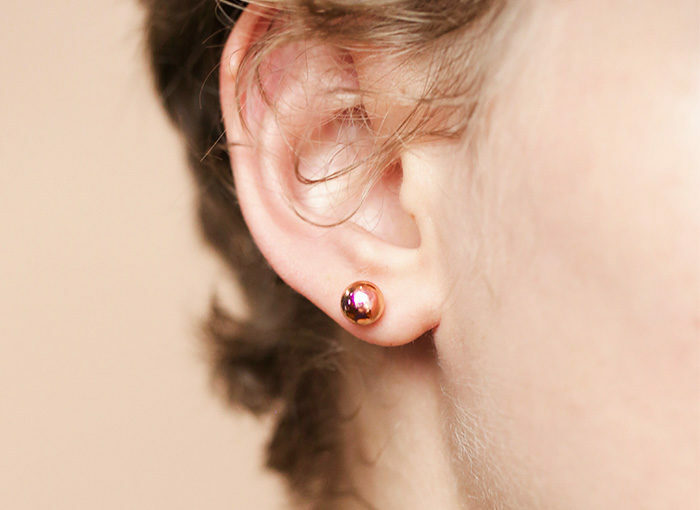 Read further to get the best styling tips for ball stud earrings. If you are a classic gal who loves patterned overcoats and warm scarves, the yellow gold stud earrings are exactly what you need. We know what you are thinking. It can’t be too difficult to style, them, can it? After all, they are studs. And you are right about that, only we are not here to teach you how to accessorize stud earrings. We are here to offer styling inspiration so that you can get a truly unique look. If you like your jewelry to be subtle and precious, these earrings are for you. Wear your hair in a sleek ponytail to let them be visible. Add a layered necklace and a tartan skirt to get a preppy fabulous look. You can skip on the bracelet, but to complete the effect, wear a signet ring, preferably without gemstones. There you have it – the perfect look for a dreamy winter day. Thinking about what to wear to the office Christmas party? 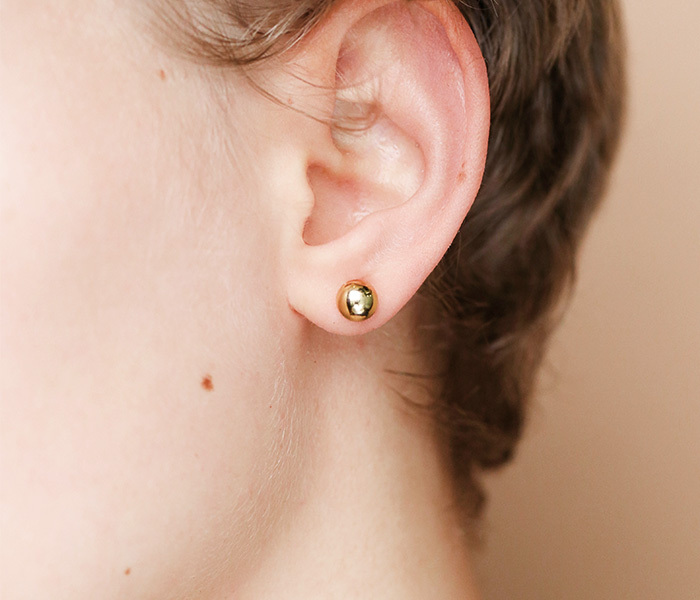 Get festive with these solid gold sleek studs. Put on your favorite pair of heeled boots, your A-line jumper dress, and a delicate pendant necklace. Stack your bangles to create a contemporary effect and try a delicate ring to complete your outfit. This year, you get to enter your office party in style. If we take a peak in your wardrobe, we will see a lot of tailored trousers, sharp suits as well as leather jackets and bandeau dresses, won’t we? Your style is sleek and modern and guess what? So is white gold. Keep reading to get inspiration on how to accessorize your new pair of white gold ball stud earrings. These precious earrings will look fantastic with your sleek hairstyle and your new pair of culotte pants. Wear them with your ankle boots, a pair of black matte tights and your favorite silk shirt. Add a torc necklace in silver and an onyx charm bracelet to get an edgy and fashionable look for after-work cocktails. Or tea, whichever you prefer. Want to make a statement but maintain your minimal style? Say no more. These glossy white gold stud earrings will look gorgeous with your velvet black dress as you get ready for the New Year’s party. Skip on the necklace, but wear a couple of chunky metallic cuffs. You can mix your metals, but, for a balanced look, we recommend wearing bangles made of either silver, white gold or platinum. Suede and fringe lover, here you are. Boho chic is what best describes your style and your summer collection is full of flowery dresses and long lace skirts. For your winter closet, you prefer suede boots, fringe jackets, and jeans with flower patterns. Your style is feminine and there is no better shade of gold for you than rose gold. If you have just received your new pair of rose gold studs, read on to get some style inspiration. Your new jumper with “Honey is Christmas” will look great with your small rose gold studs for Christmas dinner with your family. Match them with a delicate rose gold bangle and a subtle gemstone ring. 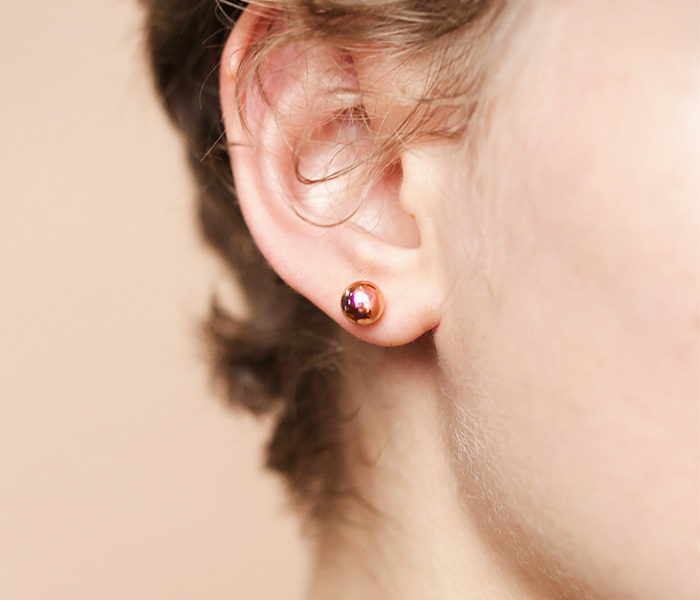 You don’t need a necklace to distract from the message, but please wear your hair up so that everybody can admire your new pair of rose gold ball stud earrings. Ana Luisa’s rose gold ball studs create addiction. You’ll become obsessed with them and never want to take them off, so here’s an idea on how to style them. Rose gold look fabulous with pearls, so try them on with a dainty pearl necklace. Skip on the bracelet and wear a solitaire ring in the same color theme. As for your outfit, now it’s the time to try your new suede skirt and your turtleneck jumper. Get comfy and read our other articles as well for more styling inspiration. And, if you haven’t gotten your pair of ball stud earrings, don’t wait too long. They will be sold out before you can say “fab”. Visit Ana Luisa online jewelry shop and choose your favorite pair of gold bead stud earrings.